Granite countertops are beautiful and durable and a good material if you are considering remodeling your kitchen. Granite is among the newest and most popular materials for kitchen counters. Every slab of granite is pulled directly from the Earth and cut to fit your countertop. Therefore, no two slabs of granite are the same. Like all materials used in kitchen countertops, granite countertops have definite advantages and disadvantages. Once you decide on a granite countertop, and in order to install a good quality granite countertop, several factors have to be considered. Added value: installing a granite countertop can add thousands of dollars to the value of your home if you resell. Must be cleaned regularly: anything acidic, such as coffee or wine, can still stain the surface if not properly cleaned up. Granite has many, many different shades. The most popular colors are black, grey, purple, and blue. All of these can come in light or dark shades. You will want to consider your preferences and look at many different possible shades before making a decision. Granite colors are warm and deep, giving the kitchen a natural look. If chosen correctly, your granite countertop can organize the entire kitchen layout. The wrong color of granite can make your entire kitchen look either too washed out or too dark. The amount of natural light coming into the kitchen, as well as the color of your walls, appliances, and cabinets need to be considered when choosing a shade for your granite countertop. Look for companies with specialized experience in granite countertops. Make sure your installation company has the proper licensing. It is better if the company performs the entire installation themselves without outsourcing any labor. Get quotes from several companies before making a decision. Make sure the quote covers the materials, labor, and installation. Remember, if any quote seems too good to be true, it probably is. Ask to see a portfolio of previous projects the company has completed; especially past granite countertops the company has installed. Once you have selected a color, ask to see the slab that will be used for your countertop. Every slab is different, so you want to ensure the slab is large enough for your project. You won’t be able to match it with another slab. Have your installer check for any flaws that are not easy to see. Warm water with dish soap works well for normal cleaning. Do not use any commercial products (such as Windex, bleach, or ammonia) unless they are specifically for granite countertops. Granite Gold and Method Daily put out cleaners especially for granite countertops. Wipe up spills as soon as you notice them. Have your granite countertop sealed regularly. If you are unsure, drop a few drops of water on the surface of the countertop. The water should bead up. If after a few minutes, the water sinks into the crevices of the counter, the counter needs to be resealed. Granite countertops can be disinfected by a mixture of half water and half rubbing alcohol. Leave the mixture on the countertop for three to five minutes, then rinse it off with water and dry with a clean cloth. Wash the surface of the countertop with soap and water. Purchase a commercial sealing product for granite countertops. Wear gloves and cover the kitchen sink so that the sealer only goes on the granite countertop. Spray the sealer on the surface of the granite countertop. Make sure the countertop is entirely covered with the sealer. Let it sit for about ten minutes. You may need to spray more sealant. Use a paper towel to remove any excess sealant by wiping the surface. Let the sealant sit for at least six hours. Wash the counter again with soap and water. With the correct installation and proper care, your granite countertop will last you a lifetime. 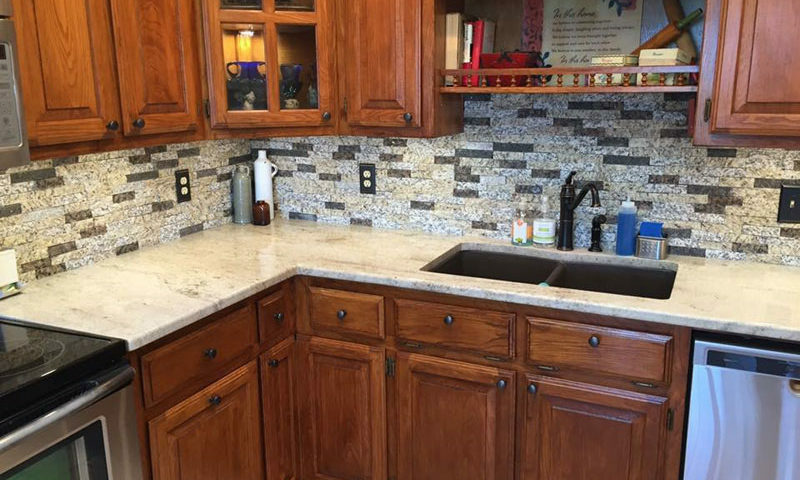 The professionals at Granite Huggers provide materials and installation for quality granite countertops. Call for an estimate today at 972-670-4533.